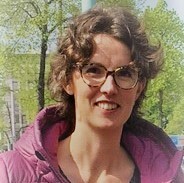 Stefanie de Hair is a cycling safety expert in the Department Integrated Vehicle Safety of TNO in Helmond since 2003. She started at TNO after her study Mechanical Engineering at Eindhoven University of Technology. Currently Stefanie is working on improving cyclist safety by the development of technology measures, both car bound (the cyclist airbag & AEB) and bicycle solutions (intelligent bicycles). She integrates cross functional solutions to increase the joy of cycling, by using a parallel approach: technology and end-user. Stefanie is co-founder of the international cycling safety conference (ICSC) and was/is involved in many EU and national projects. She plays an integrator role bringing together research, industry, and government. As cyclist safety expert she has been working on several projects, she conducted effectiveness studies on car bound solutions (airbag & AEB), analyzed single bicycle accidents, developed together with her team an innovative intelligent bicycle, conducted and coordinated behavior study on conflicts on cyclist paths, and adviced the Dutch Ministry on the speed-pedelec helmet. (more details on the topics Stefanie is working on www.tno.nl/cycling).